1611 onwards. 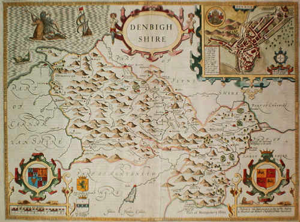 English and Welsh county maps. Maps of the Irish provinces. If you go through the little village of Farndon in Cheshire today you are unlikely to see anything to draw your attention to the fact that John Speed was born there. Perhaps, given time, much will be made of the event but today, as in 1552, the happening is, and was, taken as an every day event and John was called John after his father and as soon as he was old enough sewed up the similarity by following in his father's fashion, the trade of a tailor. At the age of 18 John Speed was admitted to the freedom of the Merchant Tailor's Company in London. He rented somewhere to live and a garden in Moorfields for twenty shillings a year. At the age of 20 he married and continued his manual employment in the business of garments. Doubtless he was well employed for these were the days of Queen Elizabeth when colour and style in dress left a vivid and interesting image in our island history. Undoubtedly a fine family man, John Speed could apply only his spare time to history and mapmaking, for tailoring brought in the money to bring up his brood of twelve sons and six daughters. His son Samuel in later years became implicated in a plot against Cromwell and was forced to flee the country for the West Indies where he joined some buccaneers and later became a sea chaplain. Perhaps we would not have seen the fine maps of John Speed if a courtier of good literary taste and discernment had not used his influence to further the careers of talented men. The courtier was Sir Fulke Greville, the first Lord Brooke, a lifelong friend of Sir Philip Sydney. Thus is was in 1598, with Speed at the age of 48, that Queen Elizabeth gave him a Waiters room in the custom house and at last Speed was able to pass onto us what had been in his mind. 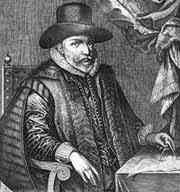 He first devoted himself to writing a history and preparing a series of county maps of England and Wales. 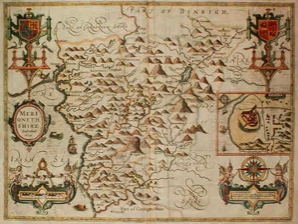 Between 1605 and 1610 he collected material including manuscript maps, coats of arms, portraits, drawings of antiquaries and rubbings of coins which he passed onto Jodocus Hondius in Amsterdam who engraved most of the maps for the Theatre of the Empire of Great Britain. 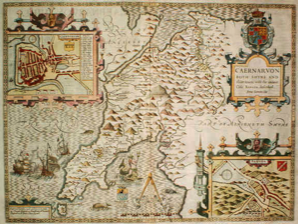 During this time Speed must have travelled extensively in the British Isles acquiring information for his unique series of town plans that appear on his maps, which are the earliest recorded plans for many of the towns featured, Proofs of his maps were issued between 1608 and 1610 and in 1611-12 all 67 maps were published in atlas form under the title The Theatre of the Empire of Great Britain. It was a most successful publication. Many copies sold and further editions were to appear for over one hundred years. Speed also prepared maps of the countries of the world, These appeared in A Prospect of the most famous parts of the World. Maybe you will find a suitable memorial to John Speed at St. Giles, Cripplegate where John Speed finally came to rest on the 28th July, 1629. He was aged 77 and had suffered blindness and gall stones in a none too enlightened era. 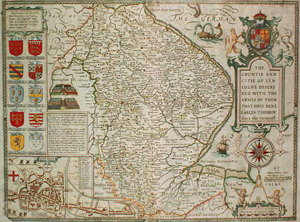 The good work he did, however, lives after him and the pleasure derived by discerning collectors who own one of more of his original maps is adequate evidence of his being one of the virile hard-working and inspired stars of the Elizabethan era. John Speed's maps were so popular during the 17th and 18th centuries that they were published many times. This is a rough guide to the various editions of his atlas. Another good early edition with dark impressions. English text reset on verso. Published by John Sudbury and George Humble, Printed by Thomas Snodham. A rare edition and the only one to have Latin text on the verso of each map. Good dark impressions Published by John Sudbury and George Humble. Edition with English text on verso. A good edition published by George Humble alone although the name of John Sudbury who was now retired continues to appear on some of the maps. The first edition to include the map of the Invasions of England, Wales and Ireland. The English text on verso was reset for this edition. Printed by John Dawson. The first edition in which the Prospect of the World was added. Printed by John Dawson. Published by George Humble. Reset English text on verso. Published with the Prospect by John Dawson. This edition was printed by John Legatt and published by William Humble, the elder son of George Humble. English text again. The only edition to be published by Roger Rea who changed all the imprint panels to accommodate the names of Roger Rea the Elder and Younger. The date of 1610 which had continued to appear on some of the maps is now changed to 1662 on some maps. Printed by Mary and Samuel Simmons. A popular edition published by Thomas Bassett and Richard Chiswell. The impressions are lighter but the margins are usually wider than the previous editions. There were some specimens printed on a thick paper The English text on verso was reset for this edition, A number of interesting maps of North America and one of the Holy Land were added to the Prospect for this edition. A rare edition by Christopher Browne who erased the imprint of Bassett and Chiswell on the maps of Hampshire, Dorset, Devon, Cornwall, Somerset and Yorkshire and replaced it with "Christopher Browne, at the Globe near the West End of St. Paul's Church London". In the past 25 years we have only offered one complete series of these maps, featured in our Catalogue 14 in 1971. An edition published by Henry Overton whose imprint appears on the maps. The roads, following Ogilby s survey, were engraved onto the old plates for this edition. Plain on verso. A rare edition and the last edition published by Dicey & Co. Pale impressions. Plain on verso. You may come across a few John Speed maps with colouring described as early. The publishers, however, did not advertise or sell the atlases coloured unlike some of the 17th century Dutch map publishers. The majority of John Speed maps arrived in the 20th century in an uncoloured state. Modern colouring is quite acceptable and the majority of present day collectors like their John Speed maps to be coloured. The quality of the modern hand colouring is important and poor unattractive modern colouring can greatly reduce the value. Did you know that many of the coats of arms on John Speed's maps are colour coded? The story of how stock of the London map trade was acquired or passed from one to another is a fascinating one. The relationships between surveyors, mapmakers, engravers, publishers and mapsellers is often complex. I hope the diagram below helps to illustrate the history of John Speed's map plates and a few other relationships. Purchased the Speed plates from William Humble in 1658 - 9. Did not use them but soon sold them to Roger Rea the elder and younger. Purchased the Speed plates and published an atlas. Sold the Speed plates to John Overton. 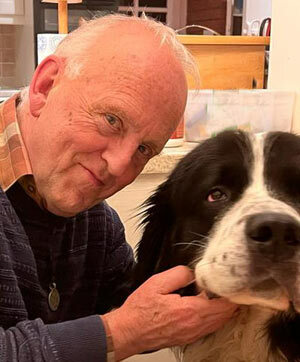 Christopher Browne. Disposed of his stock to his son Henry Overton in 1707. Acquired the Speed plates and published the last edition in 1770.